This article is about tunnels that carry runoff from urban streets. For the early sewers designed to carry both waste and storm water, see Combined sewer. For the modern sewer system that carries waste, see Sanitary sewer. A storm drain, storm sewer (U.S. and Canada), surface water drain/sewer (United Kingdom), or stormwater drain (Australia and New Zealand) is infrastructure designed to drain excess rain and ground water from impervious surfaces such as paved streets, car parks, parking lots, footpaths, sidewalks, and roofs. Storm drains vary in design from small residential dry wells to large municipal systems. Drains receive water from street gutters on most motorways, freeways and other busy roads, as well as towns in areas with heavy rainfall that leads to flooding, and coastal towns with regular storms. Even gutters from houses and buildings can connect to the storm drain. Many storm drainage systems are gravity sewers that drain untreated storm water into rivers or streams—so it is unacceptable to pour hazardous substances into the drains. Storm drains often cannot manage the quantity of rain that falls in heavy rains or storms. Inundated drains can cause basement and street flooding. In many areas require detention tanks inside a property that temporarily hold runoff in heavy rains and restrict outlet flow to the public sewer. This reduces the risk of overwhelming the public sewer. Some storm drains mix stormwater (rainwater) with sewage, either intentionally in the case of combined sewers, or unintentionally. There are two main types of stormwater drain (highway drain or road gully in the UK) inlets: side inlets and grated inlets. Side inlets are located adjacent to the curb (curb) and rely on the ability of the opening under the back stone or lintel to capture flow. They are usually depressed at the invert of the channel to improve capture capacity. 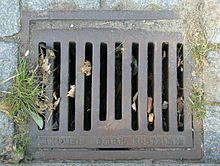 Many inlets have gratings or grids to prevent people, vehicles, large objects or debris from falling into the storm drain. Grate bars are spaced so that the flow of water is not impeded, but sediment and many small objects can also fall through. However, if grate bars are too far apart, the openings may present a risk to pedestrians, bicyclists, and others in the vicinity. Grates with long narrow slots parallel to traffic flow are of particular concern to cyclists, as the front tire of a bicycle may become stuck, causing the cyclist to go over the handlebars or lose control and fall. Storm drains in streets and parking areas must be strong enough to support the weight of vehicles, and are often made of cast iron or reinforced concrete. Some of the heavier sediment and small objects may settle in a catch basin, or sump, which lies immediately below the outlet, where water from the top of the catch basin reservoir overflows into the sewer proper. The catchbasin serves much the same function as the "trap" in household wastewater plumbing in trapping objects. 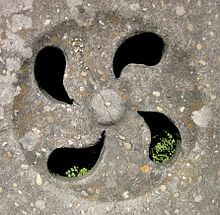 In the United States, unlike the plumbing trap, the catch basin does not necessarily prevent sewer gases such as hydrogen sulfide and methane from escaping. However, in the United Kingdom, where they are called gully pots, they are designed as true water-filled traps and do block the egress of gases and rodents. Most catchbasins contain stagnant water during drier parts of the year and can, in warm countries, become mosquito breeding grounds. Larvicides or disruptive larval hormones, sometimes released from "mosquito biscuits", have been used to control mosquito breeding in catch basins. Mosquitoes may be physically prevented from reaching the standing water or migrating into the sewer proper by the use of an "inverted cone filter". Another method of mosquito control is to spread a thin layer of oil on the surface of stagnant water, interfering with the breathing tubes of mosquito larvae. The performance of catch basins at removing sediment and other pollutants depends on the design of the catchbasin (for example, the size of the sump), and on routine maintenance to retain the storage available in the sump to capture sediment. Municipalities typically have large vacuum trucks that perform this task. Catch basins act as the first-line pretreatment for other treatment practices, such as retention basins, by capturing large sediments and street litter from urban runoff before it enters the storm drainage pipes. Pipes can come in many different cross-sectional shapes (rectangular, square, bread-loaf-shaped, oval, inverted pear-shaped, egg shaped, and most commonly, circular). Drainage systems may have many different features including waterfalls, stairways, balconies and pits for catching rubbish, sometimes called Gross Pollutant Traps (GPTs). Pipes made of different materials can also be used, such as brick, concrete, high-density polyethylene or galvanized steel. Fibre reinforced plastic is being used more commonly for drain pipes and fittings. Most drains have a single large exit at their point of discharge (often covered by a grating) into a canal, river, lake, reservoir, sea or ocean. Other than catchbasins, typically there are no treatment facilities in the piping system. Small storm drains may discharge into individual dry wells. Storm drains may be interconnected using slotted pipe, to make a larger dry well system. Storm drains may discharge into man-made excavations known as recharge basins or retention ponds. 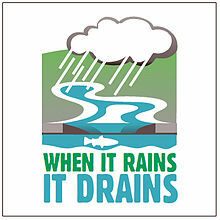 Storm drains are often unable to manage the quantity of rain that falls during heavy rains and/or storms. When storm drains are inundated, basement and street flooding can occur. Unlike catastrophic flooding events, this type of urban flooding occurs in built-up areas where man-made drainage systems are prevalent. Urban flooding is the primary cause of sewer backups and basement flooding, which can affect properties repeatedly. Clogged drains also contribute to flooding by the obstruction of storm drains. Communities or cities can help reduce this by cleaning leaves from the storm drains to stop ponding or flooding into yards. Snow in the winter can also clog drains when there is an unusual amount of rain in the winter and snow is plowed atop storm drains. Runoff into storm sewers can be minimized by including sustainable urban drainage systems (UK term) or low impact development or green infrastructure practices (US terms) into municipal plans. To reduce stormwater from rooftops, flows from eaves troughs (rain gutters and downspouts) may be infiltrated into adjacent soil, rather than discharged into the storm sewer system. Storm water runoff from paved surfaces can be directed to unlined ditches (sometimes called swales or bioswales) before flowing into the storm sewers, again to allow the runoff to soak into the ground. Permeable paving materials can be used in building sidewalks, driveways and in some cases, parking lots, to infiltrate a portion of the stormwater volume. Many areas require that properties have detention tanks that temporarily hold rainwater runoff, and restrict the outlet flow to the public sewer. This lessens the risk of overburdening the public sewer during heavy rain. An overflow outlet may also connect higher on the outlet side of the detention tank. This overflow prevents the detention tank from completely filling. Restricting water flow and temporarily holding the water in a detention tank public this way makes it far less likely for rain to overwhelm the sewers. Water running off these impervious surfaces tends to pick up gasoline, motor oil, heavy metals, trash and other pollutants from roadways and parking lots, as well as fertilizers and pesticides from lawns. Roads and parking lots are major sources of nickel, copper, zinc, cadmium, lead and polycyclic aromatic hydrocarbons (PAHs), which are created as combustion byproducts of gasoline and other fossil fuels. Roof runoff contributes high levels of synthetic organic compounds and zinc (from galvanized gutters). Fertilizer use on residential lawns, parks and golf courses is a significant source of nitrates and phosphorus. Separation of undesired runoff can be achieved by installing devices within the storm sewer system. These devices are relatively new and can only be installed with new development or during major upgrades. They are referred to as oil-grit separators (OGS) or oil-sediment separators (OSS). They consist of a specialized manhole chamber, and use the water flow and/or gravity to separate oil and grit. Catch basins are commonly designed with a sump area below the outlet pipe level—a reservoir for water and debris that helps prevent the pipe from clogging. Unless constructed with permeable bottoms to let water infiltrate into underlying soil, this subterranean basin can become a mosquito breeding area, because it is cool, dark, and retains stagnant water for a long time. Combined with standard grates, which have holes large enough for mosquitoes to enter and leave the basin, this is a major problem in mosquito control. Basins can be filled with concrete up to the pipe level to prevent this reservoir from forming. Without proper maintenance, the functionality of the basin is questionable, as these catch basins are most commonly not cleaned annually as is needed to make them perform as designed. The trapping of debris serves no purpose because once filled they operate as if no basins were present, but continue to allow a shallow area of water retention for the breeding of mosquito. Moreover, even if cleaned and maintained, the water reservoir remains filled, accommodating the breeding of mosquitoes. Storm drains are separate and distinct from sanitary sewer systems. The separation of storm sewers from sanitary sewers helps prevent sewage treatment plants becoming overwhelmed by infiltration/inflow during a rainstorm, which could discharge untreated sewage into the environment. Many storm drainage systems drain untreated storm water into rivers or streams. Many local governments conduct public awareness campaigns about this, lest people dump waste into the storm drain system. 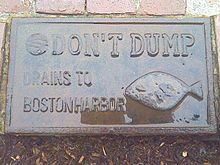 In the city of Cleveland, Ohio, for example, all new catch basins installed have inscriptions on them not to dump any waste, and usually include a fish imprint as well. Trout Unlimited Canada recommends that a yellow fish symbol be painted next to existing storm drains. Cities that installed their sewage collection systems before the 1930s typically used single piping systems to transport both urban runoff and sewage. This type of collection system is referred to as a combined sewer system (CSS). The cities' rationale when combined sewers were built was that it would be cheaper to build just a single system. In these systems a sudden large rainfall that exceeds sewage treatment capacity is allowed to overflow directly from storm drains into receiving waters via structures called combined sewer overflows. Storm drains are typically at shallower depths than combined sewers; because, while storm drains are designed to accept surface runoff from streets, combined sewers were designed to also accept sewage flows from buildings with basements. New York City, Washington, D.C., Seattle and other cities with combined systems have this problem due to a large influx of storm water after every heavy rain. Some cities have dealt with this by adding large storage tanks or ponds to hold the water until it can be treated. Chicago has a system of tunnels, collectively called the Deep Tunnel, underneath the city for storing its stormwater. Many areas require detention tanks or roof detention systems that temporarily hold runoff in heavy rains and restrict outlet flow to the public sewer. This lessens the risk of overwhelming the public sewer in heavy rain. An overflow outlet may also connect higher on the outlet side of the detention tank. This overflow prevents the detention tank from completely filling. By restricting the flow of water in this way and temporarily holding the water in a detention tank or by roof detention public sewers are less likely to overflow. Building codes and local government ordinances vary greatly on the handling of storm drain runoff. New developments might be required to construct their own storm drain processing capacity for returning the runoff to the water table and bioswales may be required in sensitive ecological areas to protect the watershed. In the United States, cities, suburban communities and towns with over 10,000 population are required to obtain discharge permits for their storm sewer systems, under the Clean Water Act. The Environmental Protection Agency (EPA) issued stormwater regulations for large cities in 1990 and for other communities in 1999. The permits require local governments to operate stormwater management programs, covering both construction of new buildings and facilities, and maintenance of their existing municipal drainage networks. Many municipalities have revised their local ordinances covering management of runoff. State government facilities, such as roads and highways, are also subject to the stormwater management regulations. Many local municipalities have commercial and residential stormwater management ordinances that require builders to design and implement an approved system. Southeastern Los Angeles County installed thousands of stainless steel, full-capture trash devices on their road drains in 2011. An international subculture has grown up around the exploration of stormwater drains. Societies such as the Cave Clan regularly explore the drains underneath cities. This is commonly known as "urban exploration", but is also known as draining when in specific relation to storm drains. In several large American cities, homeless people live in storm drains. At least 300 people live in the 200 miles of underground storm drains of Las Vegas, many of them making a living finding unclaimed winnings in the gambling machines. An organization called Shine a Light was founded in 2009 to help the drain residents after over 20 drowning deaths occurred in the preceding years. A man in San Diego was evicted from a storm drain after living there for nine months in 1986. Archaeological studies have revealed use of rather sophisticated stormwater runoff systems in ancient cultures. For example, in Minoan Crete approximately 4000 years before present, cities such as Phaistos were designed to have storm drains and channels to collect precipitation runoff. At Cretan Knossos, storm drains include stone-lined structures large enough for a person to crawl through. Other examples of early civilizations with elements of stormwater drain systems include early people of Mainland Orkney such as Gurness and the Brough of Birsay in Scotland. A storm drain discharging into the River Brent in the UK. Iron Cove Creek, Sydney, Australia. Inside a large reinforced concrete box storm drain in Mississauga, Ontario, Canada. Storm drain in Obertraun, Austria. Storm drain overflowing in Durham, North Carolina. 114" pipe installation; Pipe: 114" aluminized type 2; Flow: 25 cubic meters/second; This is a storm drain in Guasave, Mexico. The inlet to a storm drain in Markeaton, Derby allowing a river to overflow into the storm drain. ^ King, compiled by James J. (1995). The environmental dictionary : and regulatory cross reference (3rd ed.). New York: Wiley. p. 121. ISBN 0-471-11995-4. ^ King, compiled by James J. (1995). The environmental dictionary : and regulatory cross reference (3rd ed.). New York: Wiley. p. 668. ISBN 0-471-11995-4. ^ Amimoto, Perry Y. (1981). Erosion and Sediment Control Handbook. State of California. p. 109. ^ "technotes" (PDF). Maryland Transportation Technology Transfer Center. ^ "Tips to Reduce Flooding--Seattle Public Utilities". www.seattle.gov. Retrieved 2017-08-26. ^ Nelson, Tim. "Mpls. preps for possible flooding on Christmas". Retrieved 2017-08-26. ^ Brattebo, B. O.; Booth, D. B. (2003). "Long-Term Stormwater Quantity and Quality Performance of Permeable Pavement Systems" (PDF). Water Research. 37: 4369–4376. doi:10.1016/S0043-1354(03)00410-X. Archived from the original (PDF) on 2007-03-27. ^ G. Allen Burton, Jr., Robert Pitt (2001). Stormwater Effects Handbook: A Toolbox for Watershed Managers, Scientists, and Engineers. New York: CRC/Lewis Publishers. ISBN 0-87371-924-7. CS1 maint: Uses authors parameter (link) Chapter 2. ^ Shoemaker, Leslie; Lahlou, Mohammed; Doll, Amy; Cazenas, Patricia (2002). "Fact Sheet--Oil/Grit Separator Units". Stormwater Best Management Practices in an Ultra-Urban Setting: Selection and Monitoring. Washington, DC: U.S. Federal Highway Administration. ^ Clinical Medicine & Research February 1, 2005 vol. 3 no. 1 3-12. ^ U.S. Environmental Protection Agency (EPA), Washington, DC. "Public Education and Outreach on Stormwater Impacts." 2008-09-17. ^ Trout Unlimited, Calgary, AB. "How does Yellow Fish Road Work?" Archived 2009-07-17 at the Wayback Machine Accessed 2011-11-16. ^ Burrian, Steven J., et al. (1999). "The Historical Development of Wet-Weather Flow Management." EPA, National Risk Management Research Laboratory, Cincinnati, OH. Document No. EPA/600/JA-99/275. ^ EPA. "Combined Sewer Overflow (CSO) Control Policy." Federal Register, 59 FR 18688. April 19, 1994. ^ Metcalf & Eddy, Inc. (1972). Wastewater Engineering. New York: McGraw-Hill. p. 119. ^ American City & County (1996). "Chicago digs deep to better manage stormwater." 1996-06-01. ^ Water Watch NYC, New York, NY (2008-07-14). "Green Roof – Blue Roof." ^ U.S. Water Quality Act of 1987, Pub.L. 100-4 Archived 2012-02-29 at the Wayback Machine, 101 Stat. 69, 33 U.S.C. § 1342(p), February 4, 1987. ^ EPA. "Stormwater Discharges From Municipal Separate Storm Sewer Systems (MS4s)." 2009-03-11. ^ Woelkers, David A. (2002). "Tidal Wave: Stormwater Ordinances as a BMP for Phase II." Stormwater, September–October 2002. ^ "Tons of L.A. River trash will be captured before it hits the sea" Los Angeles Times. November 1, 2011. ^ a b Adams, Guy (14 September 2009). "Subterranean home of Las Vegas's losers". The Independent. Retrieved 21 May 2010. ^ O'Brien, Matt (2007). Beneath the Neon: Life and Death in the Tunnels of Las Vegas. Huntington Press. ISBN 0-929712-39-0. ^ Associated Press (17 April 1986). "Sewer loser". Beaver Country Times. Retrieved 21 May 2010. ^ C. Michael Hogan (2007). "Knossos fieldnotes." Modern Antiquarian. Wikimedia Commons has media related to Storm drain.